L-Fucose is a six-carbon deoxy monosaccharide that is equivalent to 6-deoxy-L-galactose. 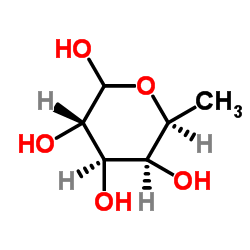 L-Fucose is found on many N- and O-linked glycans present on the cell surface of a wide variety of organisms. The most well-known fucosylated glycans are the ABO blood group antigens. L-fucose present in gastrointestinal mucous represses virulence factor-encoding genes expressed by enterohemorrhagic E. coli. Mutations in the gene that encodes alpha-L-fucosidase can cause fucosidosis, leading to a buildup of fucose-containing compounds which cause cellular malfunction. Forms a colorless, clear solution when dissolved 10% in water.